The competition within the record industry appears to be in full swing again. This time the focus seems to be on "who can provide a package of the Beethoven Symphonies plus fillers for the lowest possible price". As a first response, I would say that to this Barenboim set is too good for its low price tag. Warners are giving it away! Still the record collector is the one to gain; and gain he or she will with this package, currently available at the cost of one full-priced CD. This sort of competition will probably have a significant effect on BIS, who have just released the first in Vänskä�s new cycle with the Minnesota Orchestra. That one disc is about the current asking price for this set of all nine, plus four additional overtures. Warners seem to have been re-releasing their whole catalogue on the cheap label Apex. This multi-disc set is under half the asking price of the Apex releases on a disc-for-disc basis. �Where will it all end?�, I ask myself. Still, a set such as this could easily be poor value if the music-making was suspect. Most certainly, here it is not! It was good value at its previous asking price and at that time it did not contain the fill-ups. Here, one can purchase a highly satisfactory set of the symphonies, played by the orchestra that gave the Berlin premieres of most of them, in tip-top digital sound, played with consummate style. There are repeats all over the place, and a special accolade should be given to the timpanist who shines throughout the cycle. Tempi throughout are on the fast side, and the standard of playing is absolutely superb. Woodwinds, strings, brass etc. are all perfectly in tune with one another. I obtained immense delight from this set. Add to this, a superb set of soloists in the Choral, and extremely good notes in a substantial booklet, with a slimline box utilising cardboard inner-sleeves. There is absolutely no evidence whatsoever of penny-pinching. OK, so you don�t get the dynamism of Toscanini, but not much less. These readings miss the depth of a Furtwangler, but again, not much less, and the improvement in sound quality over the older symphonic cycles is such that one need never feel short-changed. I know that critical appreciation of Barenboim can often be varied, depending upon the critic, and his or her own perfectly acceptable foibles. I would, however, defy any of them to severely criticise this boxed set, particularly given its crazy asking price. 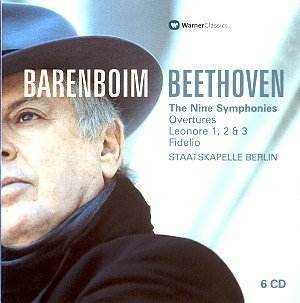 Just for the record, Barenboim�s complete recordings of the Brahms (Chicago SO), Bruckner Symphonies (Berlin PO) and Mozart Piano Concerti (also Berlin PO) have also been released this month at similarly crazy prices. Snap then up whilst they are still available, or at least until someone at Warner Classics realizes what they have done.